Once out of the liquid and cut into cross-sections, the lungs were smooth and vaguely spongy while the heart was uncomfortably pink and muscly looking. Being the intrepid culinary explorers/deluded masochists we are, we sliced off minute pieces of the heart, lung, and liver to taste them in all their unadulterated glory. I’m sure you’re not surprised, but this turned out NOT to be a good idea. Offal is generally not the most appetizing of foods when you haven’t added any additional seasoning or flavor. Then add in the fact that the innards were ice cold and straight out of a disturbingly sewage-colored meat bath and both of us ended up jumping up and down and squealing in disgust at the musty lumps of chilled sheep innards in our mouths. Lesson learned, we returned to the daunting task at hand. Dicing six onions was the easy part. Next, we tossed the heart and lung into the food processor and pulsed it gently into a fine mince. Next, we grated the liver in the food processor to avoid the pasty textured chunks from turning into pate. Here’s a photo from foodrambler’s haggis post of me working the magimix on the meat. I think the expression on my face is veering between skepticism, bemusement, horror and disgust. Note how I am as far as humanly possible away from the food processor in a vain attempt to avoid directly inhaling the stench of chopped lamb bits. Below, the pungent strands of sheep liver. All the dicing, slicing, and mincing of the heart, livers, and lungs began to fill the kitchen with a distinctly unpleasant smell. The thought crossed both our minds simultaneously: this smells exactly like cat food. Then the uncomfortable realization came to us…in fact, this is what cats eat. We are literally making cat food. As you can see, it looked like cat food too. But just when we couldn’t really hold our noses much longer, we started mixing in the onions lying underneath the offal mince and all of a sudden, the smell changed. The sharp onion scent cut into the decaying meaty odor and the mixture somehow became warm and almost familiar, like the rich wafting steam of a slow-cooked stew. The transition was aided by the inclusion of a generous amount of salt, white pepper, sage, thyme, and mace (the outer layer of nutmeg) for a layered and wintry hint of spices. The general smell of the kitchen was further enhanced by the comforting aroma of toasted oatmeal, both of the rolled and Irish steel cut variety, which we wacked into the oven until lightly browned and then added to the pot. 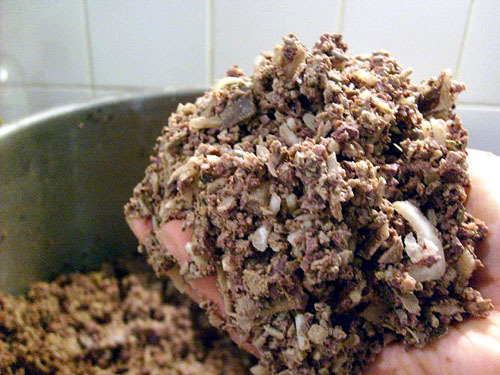 But haggis wouldn’t be complete without one last element of grossness and that came in the form of eight boxes of shredded dried suet. I had to look up ‘suet‘ on wikipedia to even find it in the grocery store – in case you’re wondering, it’s the raw fat that surrounds beef kidneys. It looks like rodent turds made of candle wax. Once we’d added a few ladlefuls of the sheep pluck stock to moisten and plunged our hands deep into the pot to mix, the haggis was smelling remarkably good and ready to be cooked. Except, unfortunately, due to a stolen sheep stomach incident at Selfridge’s as well as a mail-order mishap with a backup ox bung (the attractively named last yard of a cow’s large intestine) we had nothing to stuff our haggis into. 1. Steamed in the oven by surrounding scoops in a layer of plastic wrap and then aluminum foil. 4. Formed into balls, dipped into batter, and deep fried. Having just acquired a deep fat fryer for Rambling Restaurant, you can expect to see a lot of deep fried items making an appearance on this blog. Right up until my first heart attack. 5. Finally, after playing around a bit in a game of What Tastes Good Deep Fried? (Answer: EVERYTHING!) the ultimate haggis preparation came to us in a simultaneous bizarre great-minds-think-alike moment. I present to you – Haggis. Stuffed into an English muffin. And deep fried. It’s a Boston creme donut gone wrong or maybe so right – a rich, warm, meaty inside surrounded by a crunchy, oily, golden exterior. It was shockingly, decadently delicious, but I couldn’t eat more than two bites without feeling my arteries harden in protest. All in all, haggis making was an entertaining, educational, at times both delicious and disgusting experience. Along with the traditional accompaniments of neeps (mashed swede, or rutabaga), tatties (potatoes) and cranachan (a Scottish dessert of whipped cream, honey, whiskey, raspberries and toasted oatmeal), my understanding of Scottish culinary brilliance has increased by leaps and bounds over the past few weeks. Add in a real Scot reading Burns’ Address To A Haggis followed by a stabbing…and the haggis experience is complete. I have to raise my hat to you. Homemade haggis? WOW. 2. Your discussion of neeps reminded me of a sea shantey or ditty of some sort in which someone is “round as a neep” (read: drunk) and “tawdlin’ hame,” or walking home. I’ll teach it to you next time we’re together. Very very funny post Mei – had me laughing out loud and really reliving the whole surreal haggis-making episode. We are cat food experts now. I’m not really sure I wanted to see the steps behind what I ate that night…but thanks. I’m SO impressed with you gals and your haggis. I can relate totally Mei to not having a clue what all this was about until recently!